Vice Chancellor for Strategic Initiatives and Innovation, and the Barnes Professor of Entrepreneurship, Mike Haynie leads a broad portfolio of entrepreneurship and innovation initiatives, government and community engagement strategy, defense- and veteran-connected programs, as well as cross-campus efforts to develop and enhance academic offerings for online and nontraditional students. 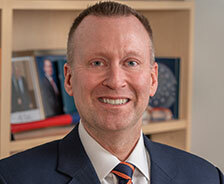 In 2018, Haynie was named a University Professor, the most senior rank conferred to faculty at Syracuse. Haynie, a United State Air Force veteran, is the founder and Executive Director of the University’s Institute for Veterans & Military Families (IVMF), the nation’s first interdisciplinary institute dedicated to informing and advancing the policy, economic, and wellness concerns of the America’s veterans and families. The IVMF serves over 25,000 veterans annually, and is widely acknowledged as the nation’s leading academic voice on issues impacting veterans and military-connected families. Haynie is a sought after advisor and speaker related to business strategy, veterans issues, innovation, and entrepreneurship. He has served on multiple federal advisory committees, and is frequently called to testify before Congress. His work has been featured on ABC Evening News, CBS News, CNBC, CNN, and Fox, and in outlets including The New York Times, the Los Angeles Times, INC Magazine, The Wall Street Journal, Forbes, the Chronicle of Higher-Education, Fortune, Entrepreneur Magazine, and The Hill. In 2013, Haynie’s efforts on behalf of veterans were the subject of “Succeeding as Civilians,” a feature story on CBS News program 60 Minutes. Haynie serves on the editorial review boards of the Journal of Business Venturing, the Strategic Entrepreneurship Journal, the Journal of Management Studies, and is an associate editor for the Journal of Military, Veteran and Family Health. Haynie also serves on the CNBC Disruptor 50 Council – a group of world’s leading thinkers in the field of innovation and entrepreneurship, who each year identify the 50 new ventures most likely to disrupt established industries and markets.